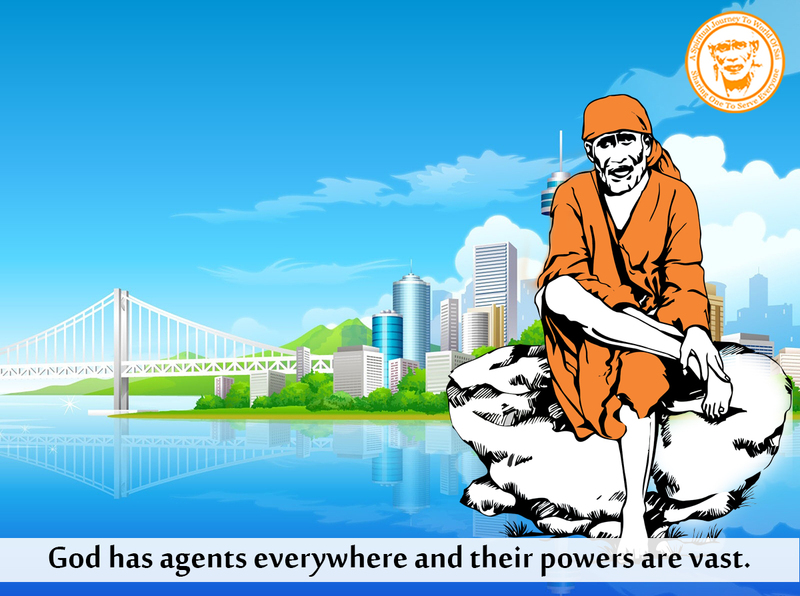 Anonymous Sai Devotee from Australia says: Dear Sai brothers and sisters, I am proud to say that I am a daughter of Sai Baba too. I hope your life is blessed by our Sai's presence and love. And to Hetalji for activating this blog, a big thank you because this has been the channel of hope for me and I believe others would share the same thoughts too. This blog has helped me reinforce and strengthen my faith in our Bhagavan Sai Deva because the miracles I read are the true testimony that our Sai's words are True - "Although, I am gone from this physical body, My bones will speak to You from My grave". My dear Sainath, thank You Baba. Before I write about my miracle, I would like to tell you that just like most of you, I too thought and prayed to our Sai that when my issue/problem was resolved I would write this post. But our Baba had awaken my mind to that fact we should not trade our faith. Our Sai wants Shraddha(Faith) and Saburi(Patience) arising from our sincere devotion to Him. So I told myself that I would write this post although my issue is still pending its outcome. As I hold on to our Sai's hands with undying faith, I know He would intervene for me in some way to positively resolve this issue for me. 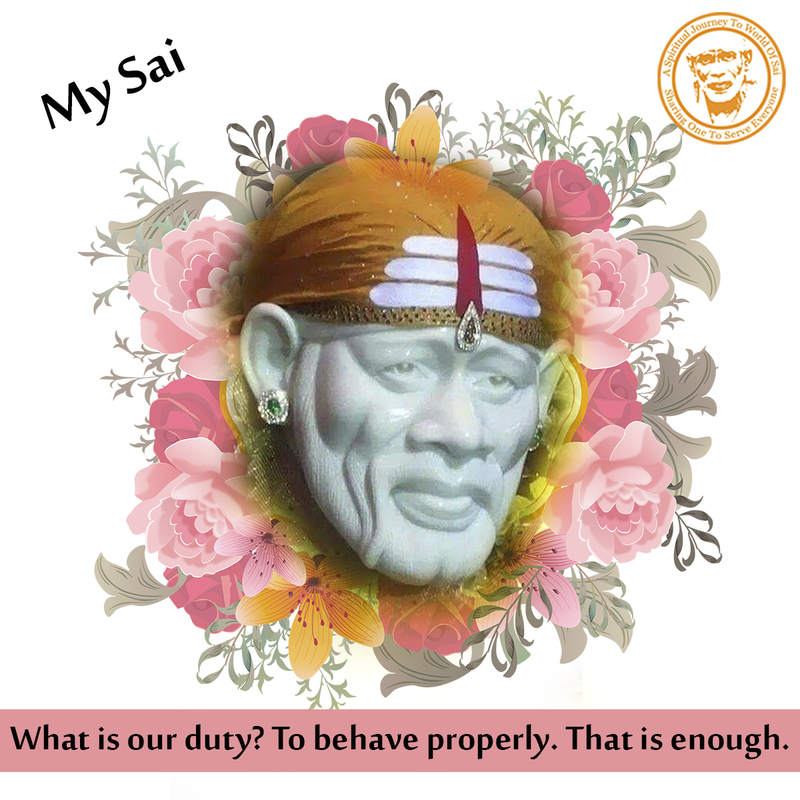 Sai Deva would always bless us and ease our problems because He knows our devotion is true and in Divine’s right timing our problems are taken away from us by our beloved Sai Baba. Now for my issue which is still yet to be over. But with my full confidence and faith in my Sai Baba and His presence in my life, I sincerely believe it will all be positively resolved for me soon. My husband had lost his job and was unable to secure another till to-date. I was stuck alone to maintaining my family all by myself. I worked for 7 days doing 2 part time work (AM and PM on weekends) with a full time job on weekdays. It was very hard. I also had my business license which I decided to sell to make some money. But the license name couldn't be change and was taking too long. So the buyer told me that she wants to start the business running in my name until the change of name can happen. Wanting to keep my promise of selling my business to her and for taking her payment, I started the operations. Initially, it was running well but later she made many errors in the way she was claiming monies for services offered. The business started in July. By August the mess and errors in business started to escalate. Although I was helping her, I was totally unaware of it as she took care of the finances and I took care of the operations. Then one night as I was sleeping, I was rudely awaken by a voice shouting at me saying "Wake Up, why are you sleeping?" When I got up half asleep, I saw a man wearing a black coat and some kind of white clothing at the bottom. Although I was half asleep, I saw his face and then he disappeared. I was puzzled as to who he was but later thought it was just a passing spirit and didn't pay any attention to it (I will tell you who he was later). Then in September, I received a warning letter from the government saying that there were errors in our business and claims were not justified and they wanted a response from me. I had to close my business by force, to stop any further issues. All these devastated me and I went into a panic attack. I started to lose a lot of weight as I stopped eating for days and was worrying about this issue. I was losing sleep too. Miracle 1: While working through this issue, one day as I was watching TV, there was a pop up advertisement on Sai Baba's movie. Now you must know this and I hope I don't offend anyone as I say this. Before I came to know of Shirdi Sai Baba, I never liked Sai Baba because of some unscrupulous people claiming to be Sai Baba's disciple was doing fraudulence. So although many times, I had seen information on people who claim to be Sai Baba, I never took interest in it. I always pray to my Lord Ganesha and Maa Durga. But this time when the pop up advertisement came, something changed my mind and prompted me to watch it. It was then I fell in love with my Shirdi Sai Baba and His way of life and His teachings. This happened on Baba's favourite day - Thursday, 6 Oct. Following this, I searched on the Internet for more information on Shirdi Sai Baba. Every information I got, drew me closer to Him. And in one website, I read Baba words saying that Baba pulls His devotee to Him because He wants to keep them close to Him. I was in doubt and asked myself "Why me? 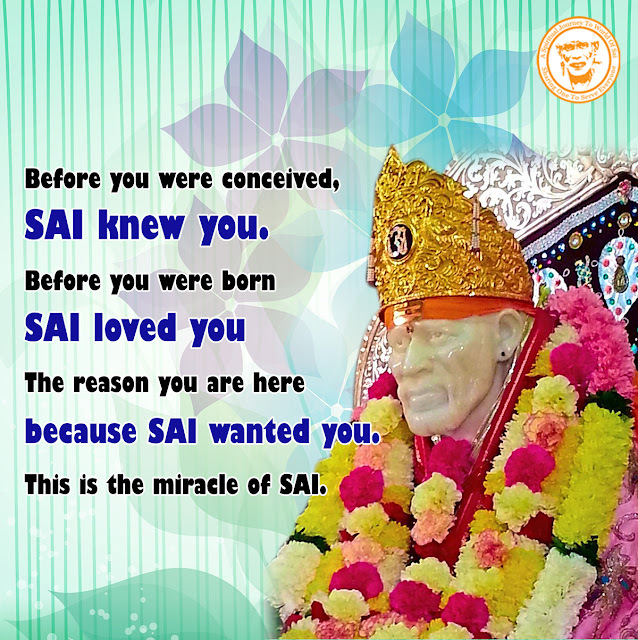 Is this really true because I have never known Shirdi Sai Baba, so how can He come to me?" I then decided to ask Baba if this was really true. Everyday, I always get up at 3am to do my prayers and on 10 Oct(Ram Navami - Baba's favourite occasion) after finishing my prayers, I thought to ask Baba or rather test to see if Baba really came to me to help me out of my problem. Now remember this, I have never known Shirdi Sai Baba and I don't have any pictures or photos of Him in my house. So there's no way I could see Him at this early hours. But I told Baba, "You are Divine Lord, if it is true that You had pulled me to You so as to help me, I want to see Your face now. I called out to our Sai Baba 3 times. I looked around and saw nothing. So I forgot about it and checked my phone for the time. Just then, I saw I've received a whats app message. Thinking who could have sent me a message, I opened it. What I saw made me fall off my seat. It was a video on Shirdi Sai Baba and not 1 face but 6 faces of Him. I was in shock and was more puzzled because it was sent to me on 9th Oct (Baba's Favourite number -9) by my husband who is a Catholic from birth. Questions ran through my head - Where did he get this video? And why did he send it to me? Later, I came to know that he was talking to his friend who was also a Sai devotee and he sent him the video which was forwarded to me. What a miracle? And how true is it that Baba hears us and answers our doubts and prayers. Thank You Sai Deva. Miracle 2: As time passed on, the issue was delaying further and further. Fear gripped me and my mind was thinking of various negative scenarios. I was very upset with my Lord Ganesha Whose approval I sought out prior to starting the business. I asked Him "Why did You do this to me? I asked for Your approval and You gave it to me but now I am in trouble". I cried a lot as I finished my prayers. That night, I had a dream. I dreamt my daughter (unmarried) was pushing all my God statues from the altar. And Lord Ganesha's statue was falling down but I caught it before it touched the ground. I asked my daughter “Why are you doing this?" She answered they (God) have cheated me". And I asked her "How?" She answered "I am pregnant mum". In my anger that she is unmarried but became pregnant, I slapped her and cried my heart out telling her that "I trusted you, why did you disappoint me". My daughter sat down on a chair. I went up to her, fell at her feet and with my head on her feet and eyes closed I told her again" I trusted you but you cheated me". When I opened my eyes, I saw our Sai Baba's feet. Shocked, I kept staring at His feet. Then Baba held my chin in 1 hand and the other hand on my head and lifted my face to see Him. My face was so close to our Baba that His features and smile is still embedded in my mind and heart. And lovingly He told me “What have I cheated you? Everything I did was for your good". Hearing these words, I suddenly woke up. I could not understand what had happened and what it meant but I knew that Baba had His reason for closing my business within 3 months. Then as I was checking into all the business paperwork, I realised that there were a lot of discrepancies in the business financial claims. It was then I realised the reason by what Baba meant when He said that everything was done for my good. If the business had still been active, the mess would have been greater which could have impacted greatly on my family. Thank You Sainath for Your prompt and readiness to come to my aid at the right time. If not for my Sainath, I would have been in worse situation. Miracle 3: Remember, I told you I saw a man in my room shouting at me to wake up and he was wearing a black coat with some kind of white clothing at the bottom. When I started to read Sai Satcharitra on the Internet, my friend who is also a Sai devotee, bought for me the Sai Satcharitra book. As I was reading the chapters, I turned to a page where there was a photo. I was shocked to see the person on the photo wearing a black coat and white dhoti. I looked at his face closer. Behold! I remembered him to be the person I saw in my room asking me to wake up. He was none other than Baba's closest devotee, Hemadpant. I was dumbfounded. I was in a state of shock. Then slowly things were coming back to me. Now I know, Baba had sent His closest devotee to warn me much earlier but I didn't understand what was happening until Baba came to me. How merciful are You, my Sai Deva. My issue is still pending on its outcome and just like everyone else, I do have my fear and feelings of uncertainty too. But I push myself to stop thinking negative and have my full faith in my Sai Deva as I surrender to Him. I know despite my feelings of doubt and fear, my Baba will understand my fear and will resolve everything well for me and my family soon. I conclude this post with a message to all of you that as human we have fear and I know Baba had said "Why Fear When I am here". Although it is very hard not to fear, I encourage you and myself too to hold on tightly to Baba's hands and stay close to Him as He will take care of the rest. I can say confidently that I will submit my next post on how my Sai Baba had intervened in this matter and His Divine blessings in resolving this issue; all in favour and successfully for me. With all my Faith in our Sai Deva, I patiently wait for His mercy and blessings. I know that as I surrender myself at our Sai Deva's feet, Baba will bless me at the Divine right timing. I love You Baba. Om Sai Ram. Shree Sai Maharaja Ki Jai. Anonymous Sai Devotee from Singapore says: Myself a small devotee of Baba, sharing few day to day life experiences. Miracles of Baba Hail to Sainath, Who is really Nath of everyone who surrender themselves wholeheartedly to His Lotus feet with real devotion. He will be there for you whenever you need Him. Few such experiences brings me more and more closer to Him everytime. Thanks to Hetalji and team for creating such a good platform where people can share their grievances and get solutions of their problems apparently. I am sharing my recent experiences. 1)Passport - I am staying in Singapore, my passport validity was just 9 months(Sept 2017) more. We had planned a Malaysia trip in January 2017 end. So I decided that after coming back from Malaysia trip I would renew my passport as it may take another 2-3 Weeks. And I didn’t want to take any risk as my Dad's health was my major point of concern. I was worried if I give my passport for renewal and if something goes wrong, what would I do? Another option was renewing passport in urgent, which looked uncertain to me as my husband will not pay for hefty fees of urgent renewal, I was damn sure. So I was just thinking Baba, I surrender to You everything, as You have to take care of everything. And here comes the miracle of Baba. When my husband went to apply for Malaysian Visa, they said the Passport Validity should be minimum 11 months then only we can apply for Visa. So we were left with no option rather than renewal of my passport in urgent. I was just happy in my mind that Baba I didn’t insist You for anything, I was just worried in my own problems and You solved it in minutes. So this is our Baba Who really helps those who don’t have anyone. I really felt blessed and happy that now I would get my passport in just 3 days. 2)Aadhar Card - As I told I had to renew my passport in urgent, another tension was waiting for me. Usually my husband keeps all original and important documents with him. All means everyone’s, even mine- like Passport, Aaddhar Card and etc. He thinks I don't keep my documents properly. So when I went to passport office, they asked for aadhar card scanned images for address proof. I was not having aadhar card scanned images at that moment. I called my husband. And as usual he answered he didn't have my adhar card, he had given to me when I visited India. I was so sure that it was with him and now he couldn't find so he was blaming me that he had given to me. I was so tensed then somehow I managed to give some other address proof (Bank Statement). But I was praying hard in my heart Baba, that why He put me in such situations. Why every time blame comes on me? I went to 'Ask Sai Baba' website and asked Baba where would I get my Aadhar card dated (09-01-2017 - Monday), as you all know how difficult to make such government documents. I got answer that "You will gain through a youngster. New introduction will take place. You will see that you will gain on Sunday coming after the day of the question." I didn't understand anything from this answer but I had trust that Baba's words are always pregnant with some meaning. So I just thought may be on Sunday I will find my Aadhar Card. Then same day Monday I had to attend farewell of my ex-colleague, so when I went there, I met a young girl, and she became friend to me like a young sister. I thought Baba might have said about this young friend only. Then I just forgot and week got over and then came Sunday. Since morning I was busy with my household chores. Later I was behind my son to sit for studying with me but don't know why he was not ready. It was like a signal from Baba that since you are free now you search your Adhar Card. And He reminded me to search. I searched in all my files but since it was not with me then how would I get it? I was disheartened and sat on bed. Suddenly it clicked to me to check the drawer of my husband, near bed. And to my surprise, both adhar cards, mine and my son's were in front. I was so happy that Baba saved me from all false accusations. But since I knew that it was not my fault so I decided when my husband would ask I would warn him not to accuse me next time if anything was missing. I got my documents, that was all. When my husband returned, I don't know why he checked his drawer and he called me and said "Do you know where your card is?" I said Yes, I know I found it in your drawer, and you said you gave it to me. I was really upset and angry on how people accuse others without thinking for a minute. 3) VSS Login - I usually read these experiences while on the way to office. But I have to change buses and trains so sometimes it is difficult for me to finish one day experience before reaching office. That day also, just 1 experience was left 'Udi Miracle' so I thought, after reaching office I will finish first. But as soon as I reached office, I logged in and got greedy to start first all applications and decided to finish the last experience later. But here started my test. I tried to login to one app, and I was keying in correct details but it gave me error message for continuously 4-5 times. Daily I login with same details but now what happened suddenly that I was not able to login. Then I understood it was Baba's wish to read the experience first. I read the last experience and said 'Jai Sai Ram'. And I tried to login again. To my surprise, I logged in successfully with same login details. What would you call it? Am not exaggerating and I didn't said anything to Baba that why was I not able to login. And after finishing the reading, I just tried casually but Baba made me to login at ease. He Who takes care of everything for you will always makes your life cool. Why you need to worry? I am bit worried about my Papa's health. Just praying to Sainath to get him operated successfully for Cataract and Give him good health. Baba we are nothing without You. Please be with us always. Anonymous Sai Devotee from US says: Dear Hetalji, I believe in God and have been a devotee of Baba since childhood. But it is in the past 5-6 years that I have become a strong devotee and read Sai Satcharitra, do Sai Divya Pooja and Sai 9 Guruvar Vrath. I believe that He is my path to salvation. Thank you so much for having this blog, I begin my day with reading devotees’ experiences and find that it helps me remember Sai throughout the day and my day goes smoothly. This Blog bring me happiness and joy every day and confirms my faith in Sai. May Baba bless you in abundance with all that is good. I have many, many miracles small and large that have happened in my life but will share 2 of them. About 2 years ago we got a call saying that my Mother-in-law had Cancer. Both my husband and I were very, very worried since she lived alone in India. We prayed to Shirdi Sai and did the 9 Guruvar Vrath. In a few months all the results came back negative and she is fine now. Last year my Mother had seizures suddenly and they suspected issues with the brain. When my daughter and I went to visit Him, Baba appeared in many different ways to assure me that everything would be fine. He appeared on the plane TV screen in the US and the idol was exactly the same as what I have in my house. On reaching I found my Mother sitting up and making a good recovery. She then had to go through a biopsy. She did not come out of anaesthesia for 2 days and then she was not recognizing people and was not able to speak. There was a small rupture of a blood vessel and there was blood in the brain affecting the speech areas. We were very worried. My husband and I again did the Nav-Guruvaar-Vrath and my Mother has completely recovered. Only Sai can make such things happen. Sai has helped me with many, many issues that I faced at work by showing me a way out. I believe that we need to go through certain things due to Karma but Sai reduces the effects and gives us the strength to bear them. I am also happy that I had enough good karmas to be a Sai Devotee in this life. Sai, please guide me and my family and be with us always till the very end when we can merge in You. I have always wanted to visit Shirdi with my family and I see the live darshan and imagine myself standing in front of Baba. Baba, please, please grant me that wish for a safe comfortable trip to Shirdi with my family. I don’t have a base in India. I really wish I could make a trip at least every year. Baba, please help me. Baba I am doing 5 Weeks Divya pooja and will be doing 5 day Sai pooja after that. I will also do Nav Guruvar Vrath after that. Shirdi Sai, please guide and protect me and my family and friends and also all Your devotees. Sai Ram, Samastha Loka Sukhino Bhavanthu. Anonymous Sai Devotee from US says: We are in US at present. As my husband is working here we came from India, I am a mother of two kids and I am not working. This is my second post. First of all I would like to thank a lot for maintaining this site, whenever I am free at night time I would be reading these Sai Baba’s experiences of many devotees. I love You so much Baba, always be with us and take care of us Sai. I am a devotee of Baba from 2004, when I was studying my Intermediate first year. My younger sister always prays Baba, from her I also started believing Baba so much that I too have number of experiences of Baba. Coming to my recent experience today is January 14th Saturday. I was very much worried about my husband’s project as it was ending by this month end and another project they told that it was in Columbus. But it was getting delayed and we had given two months of notice period for this apartment and it would get end by this month and due to that I was continuously praying Baba that only You can solve this problem for us and no one else. At last, today we got a call from office saying that the new project was going to start in Houston. This is only because of our Sai Baba only. He tested me and finally He gave us what we expected. Thanks a lot Baba for Your grace on us. Always be with us Baba. So everyone always believe in Him. Our Sai will always protect us guide us and help us when every time we would believe in Him wholeheartedly. Om Sairam. Anonymous Sai Devotee from India says: I am a devotee of Sai who experienced His presence in all my hard times of my life. Each day in my life after six years of my married life was going in bad situations. I was second time pregnant with blessings of Sai Baba. Frequently I visited Sai Mandir during my pregnancy. As months were passing during my pregnancy I didn't know what was going in my husband's mind. He used to avoid me, getting angry without reasons. During that time I was very much worried about me and my baby’s health because of his rude behaviour. I prayed to Sai to save me and my child with His grace. To my surprise I received Satcharitra from priest in temple and I completed it in a week. I came to my mother and had a healthy beautiful baby girl with grace of Sai Baba. After this I came to know the reason of my husband's rude behaviour. Listening words of his sister and other persons he asked me to leave my in-law’s home and to have delivery in my mother's home. My inner voice to Baba, I am blessed with You, always be with me forever. Anonymous Sai Devotee from US says: Thanks to everyone who helps us to share our experiences with Sai in our life on this beautiful platform. You guys do a wonderful job. 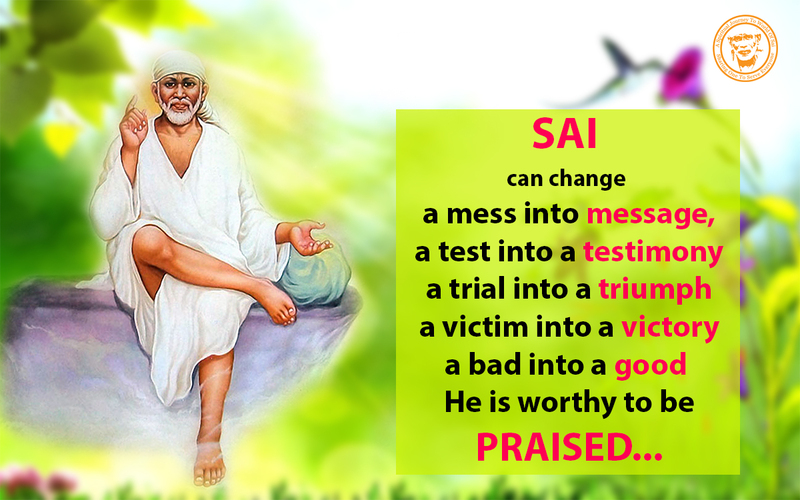 I have experienced so many miracles in my life with Sai's blessings. This is my second post here. I am a worrier and also anxious when it comes to my children's wellbeing. I have been praying to Sai for good health of my family especially my kids. Thank You Sai for being with them every moment and thanks for taking care of my son and daughter. I can't imagine a life without Your blessings. Please be with all Your devotees and guide us throughout our life. Let's bow to Sai and peace be with us all.